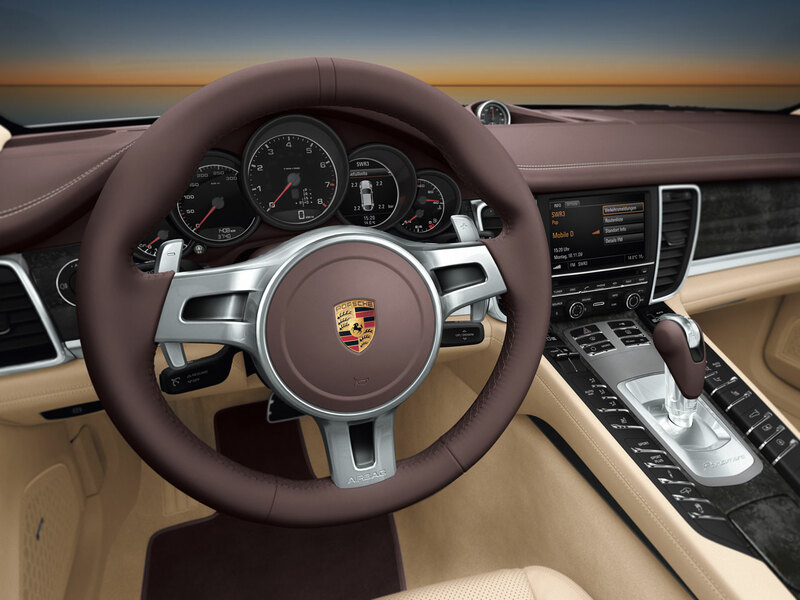 A number of technical and design “firsts” in the luxury performance class The Panamera offers no less than five world-first innovations in the luxury performance segment. • Porsche’s new Gran Turismo is the first car in its class with active aerodynamics, provided by the rear spoiler, which moves up and down automatically and is adjustable in its angle. 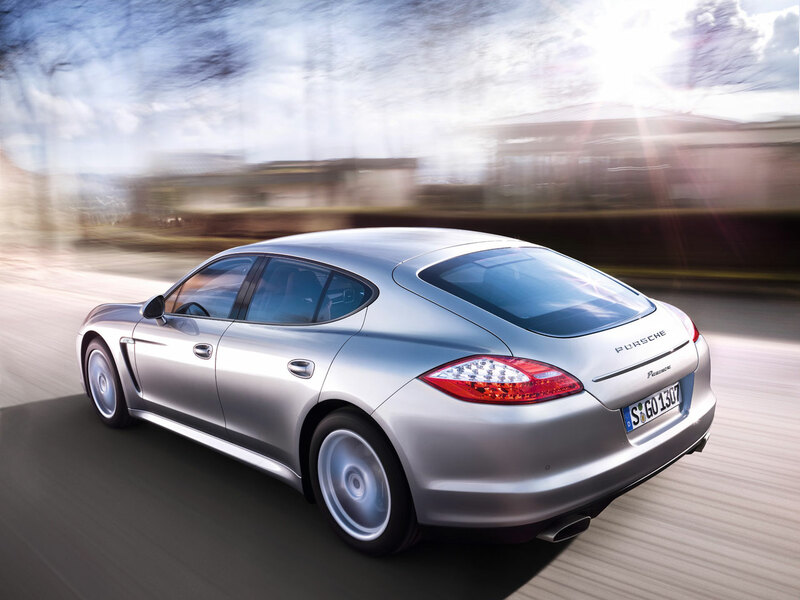 • It is the first car in this segment with a double-clutch transmission, the Porsche-Doppelkupplungsgetriebe (PDK). 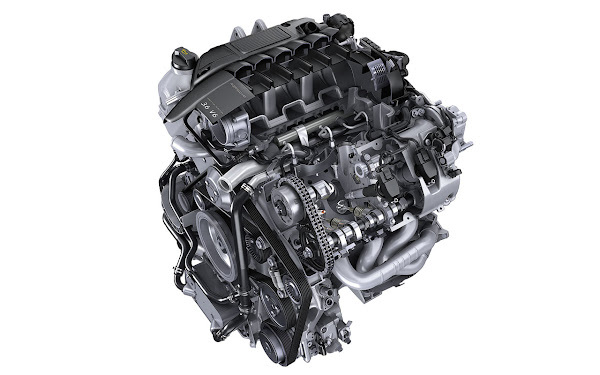 • It is the first car to combine an engine start-stop system with an automatically shifted double-clutch transmission. • It offers air suspension with additional, on-demand air volume in each spring for a wider range of comfort and performance options. • Finally, it comes with the first Sport Chrono package in the segment, giving drivers the option of an even more sporty setting for the engine, suspension and transmission, as well as other features like launch control, at the simple touch of a button. It all starts with the Porsche Gran Turismo’s lightweight, aerodynamic body, which is remarkable for its impressive spaciousness, robust strength and light weight. 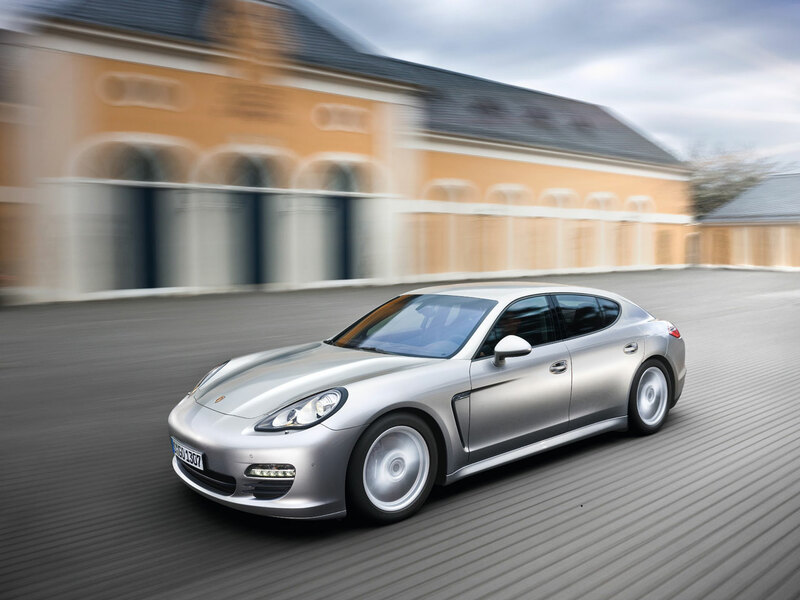 Using a cocktail of strong, lightweight materials including boron steel, aluminum, magnesium and high-tech composites, the body of the Panamera contributes to its light weight and fuel efficiency; it also means the Panamera handles with a level of responsiveness and agility that is more typical of a Porsche sports car than a luxury sedan. 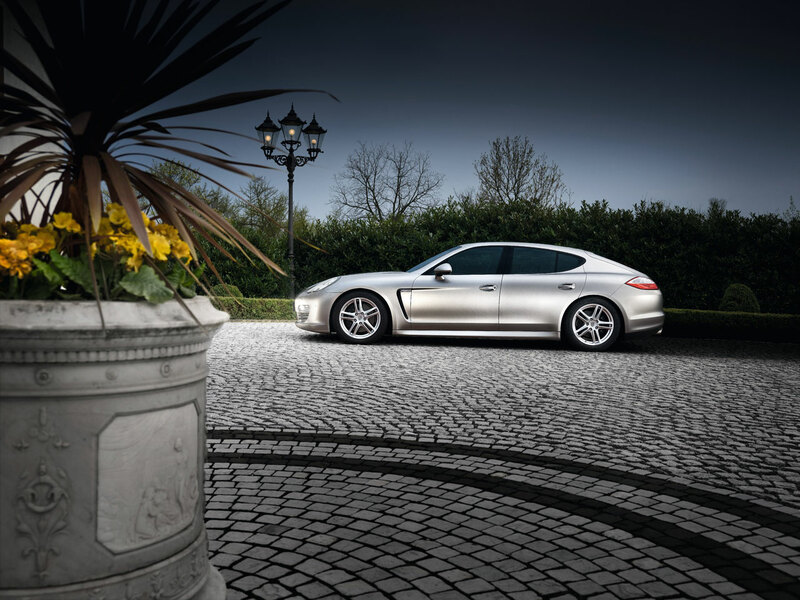 With a smooth, almost completely enclosed underbody and flush side glass, the Panamera slices through the air more efficiently than larger, blockier sedans; its careful sculpting also, however, improves the refinement of the cabin, minimizing wind and road noise. As is typical of Porsche sports cars, the body also adapts its shape to the driving conditions at hand. On the Panamera S and 4S, a speed-sensitive rear spoiler deploys from beneath the rear window to reduce drag at high speeds and even changes its angle to provide downforce during sporty 4 driving; the Panamera Turbo features an even more elaborate four-way wing design that spans the entire width of the car. Its innovative packaging, with four individual seats and a variable space concept, is incredibly roomy and versatile, with generous room for four and their luggage. Wrapping it all up is a shape styled by chief designer Michael Mauer according to Porsche’s traditional “form follows function” philosophy. 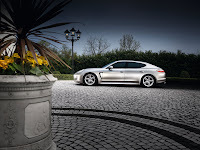 Different from anything else in the class thanks to its unique silhouette and its design cues (such as the “topography” of the hood and front fenders and the low-set air intake at the front instead of a traditional grille), the Panamera is typical Porsche: clever, interesting and unexpected. Power and performance come courtesy of new direct fuel injection engines, producing 400 hp in the Panamera S and 4S and 500 hp in the Panamera Turbo. A standard Porsche Doppelkupplungsgetriebe (PDK) gearbox, which drives the rear wheels in the Panamera S and all four wheels on 4S and Turbo, swaps cogs with no interruption in power. Both features, however, are major contributors to overall fuel efficiency; more efficient combustion, an automatic engine start-stop system and seven seamlessly shifted gears with a super-tall seventh gear for cruising produce some of the best economy numbers and CO2 emissions in the class. 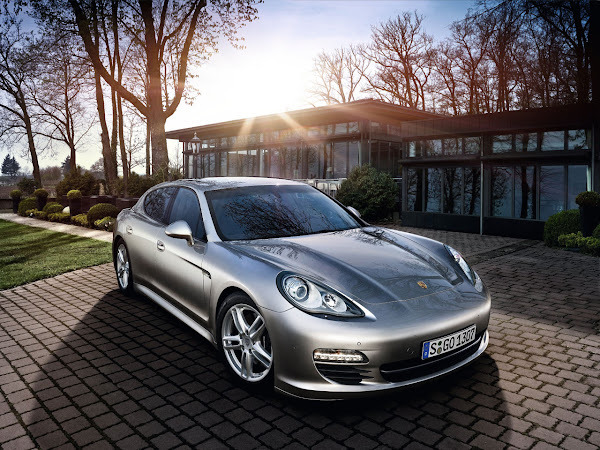 In order to deliver the ride quality of a luxury car with the handling and precision Porsche customers expect from a sports car, the Panamera engineers developed an air suspension that can vary the volume of air on demand, giving it a wider range of comfort and performance setup options than any other car in the class. When driving aggressively, the system actually halves the amount of air at each corner of the car, stiffening the suspension in turns. 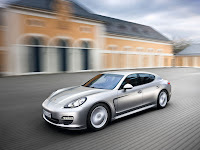 Optional Porsche Dynamic Chassis Control (PDCC) further enhances both the performance and comfort of the Panamera, using active roll stabilization to eliminate body roll during cornering and disconnecting the rollbars altogether on rough roads for a smoother ride.